The frenzy has started!! 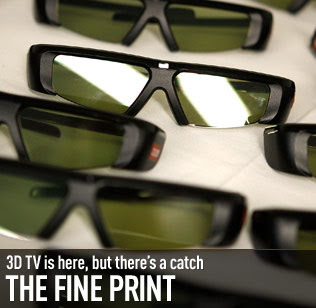 With the availability of 3D television, the world is a-buzz with the idea of this life-changing technology. But be aware - watching 3D TV can be harmful (so the manufacturers are telling us). In fact, if you're like me and enjoy watching sports and enjoying a beer, then whatever you do, don't watch the upcoming Germany vs Australia FIFA world cup game in 3D - actually it's dangerous to watch anthing in 3D during or after consuming alcohol!! This is just one of the many warnings issued under Samsung's safety guidelines. In Australia, Samsung will be releasing the first range of 3D TVs in stores as early as next week (at the behest of competitors Sony and Panasonic). Australia vs Germany is just one of 25 FIFA World Cup matches that will be filmed in 3D. So be warned... and be very careful - do NOT drink and watch!! 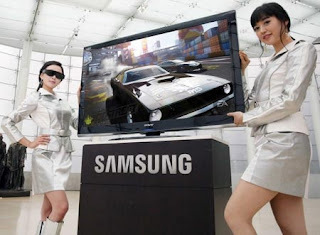 Other groups who have been warned by Samsung not to watch 3D TV, include those who suffer from epilepsy, the elderly, pregnant women, any children under the age of six years old, and anyone who has not had enough sleep. To minimize the possibility of serious accident, Samsung are also warning people to be careful where they place their 3D TV. According to the guidelines, "Do not place your TV near open stairwells, cables, balconies, or other objects that can be tripped over, run into, knocked down, broken or fallen over". • Children and teenagers may be more susceptible to health issues associated with viewing in 3D and should be closely supervised when viewing these images. Children under the age of six should not view 3D TV. • Some viewers may experience an epileptic seizure or stroke when exposed to certain flashing images or lights contained in certain television pictures or video games. If you suffer from, or have a family history of epilepsy or strokes, please consult with a medical specialist before using the 3D function. • Even those without a personal or family history of epilepsy or stroke may have an undiagnosed condition that can cause photosensitive epileptic seizures. • Pregnant women, the elderly, sufferers of serious medical conditions, those who are sleep deprived or under the influence of alcohol should avoid utilising the unit’s 3D functionality. • If you experience any of the following symptoms, stop viewing 3D pictures immediately and consult a medical specialist: (1) altered vision; (2) lightheadedness; (3) dizziness; (4) involuntary movements such as eye or muscle twitching; (5) confusion; (6) nausea; (7) loss of awareness; (8) convulsions; (9) cramps; and/ or (10) disorientation. Children and teenagers may be more likely than adults to experience these symptoms. Parents should monitor their children and ask whether they are experiencing these symptoms. • Viewing 3D television may also cause motion sickness, perceptual after effects, disorientation, eye strain and decreased postural stability. It is recommended that users take frequent breaks to lessen the potential of these effects. If your eyes show signs of fatigue or dryness or if you have any of the above symptoms, immediately discontinue use of this device and do not resume using it for at least thirty minutes after the symptoms have subsided. • Watching TV while sitting too close to the screen for an extended period of time may damage your eyesight. The ideal viewing distance should be at least three times the screen height. It is recommended that the viewer's eyes are level with the screen. • Watching TV while wearing 3D glasses for an extended period of time may cause a headache or fatigue. If you experience a headache, fatigue or dizziness, stop viewing TV and rest. • Do not use the 3D glasses for any other purpose than for viewing 3D television. Wearing the 3D glasses for any other purpose (as general spectacles, sunglasses, protective goggles, etc.) may be physically harmful to you and may weaken your eyesight. • Viewing in 3D may cause disorientation for some viewers. Accordingly, DO NOT place your TV television near open stairwells, cables, balconies, or other objects that can be tripped over, run into, knocked down, broken or fallen over.